I have a weakness and it is fish and chips. People often ask me where they can find the best fish and chips. It’s impossible to say. So many places do a good job with our local specialty. Of course, it became our specialty because of our British Isles ancestry. Old Blighty is where fish and chips was invented. And, to be honest, England is where I had a simply amazing feed of fish and chips at a place called Chez Fred in Bournemouth. What I received wasn’t so much a piece of cod fillet as a whole fillet. This beautiful, long cod fillet was encased in the crispest, golden beer batter and accompanied by fat chips bearing only a tinge of brown. I remember sprinkling a generous amount of Sarson’s Malt Vinegar and some table salt on them. It was a memorable meal. 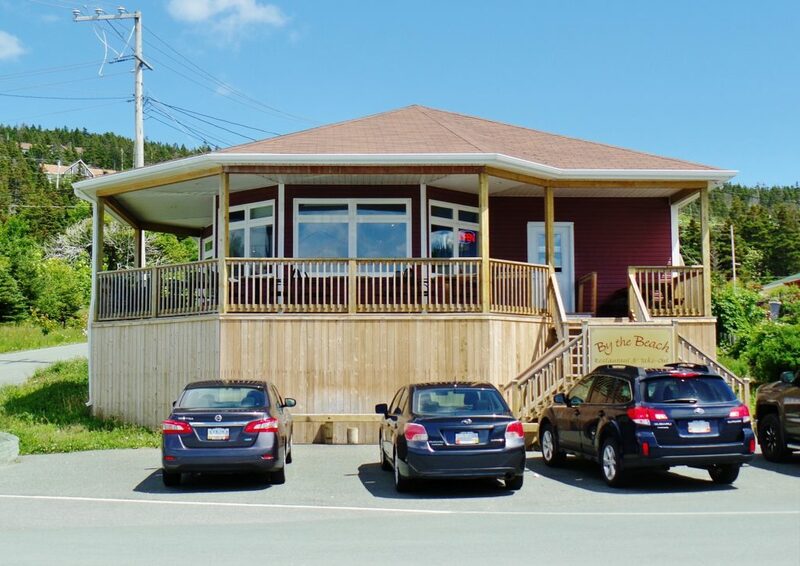 I headed to Portugal Cove-St. Philip’s and By the Beach Restaurant for my latest taste of fish and chips. By the Beach is on St. Philip’s Beach next to the small marina. The building is very close to the water’s edge and has, from both its spacious deck and inside dining room, an impressive view of Bell Island. 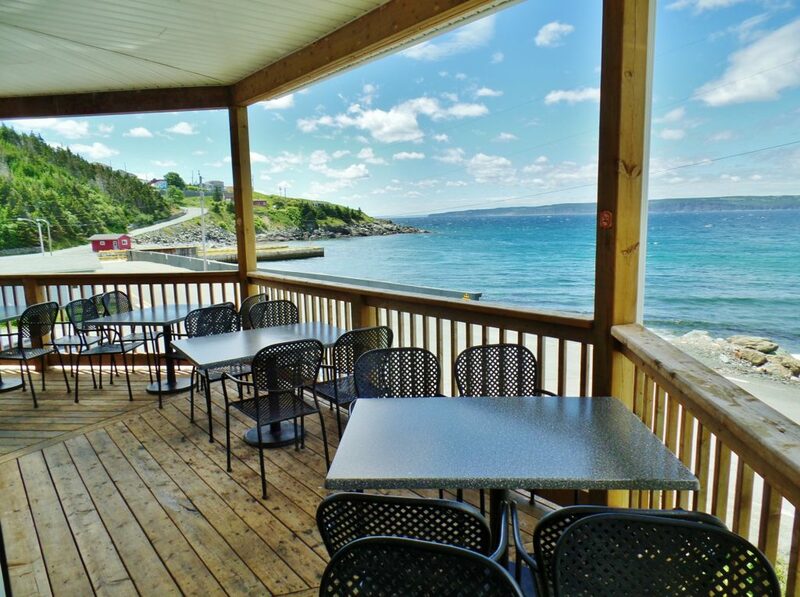 It would be hard to find a better spot for a fish and chips restaurant and take-out. Before heading inside, you can fill your lungs with fresh sea air. What could be better for the appetite? Inside, patrons order from a wall menu and then take a seat at one of many tables. By the Beach can accommodate about 30 inside and a further 30 on a wraparound deck. Unfortunately, By the Beach does not accept credit or debit cards. It’s a cash only operation, but one with an ATM machine near the counter. It’s a Godsend for anyone in need of a few bank notes to pay for a fish and chips, hot turkey sandwich or other item from the mostly deep fried menu. After placing our order we sat by a window and watched the waves crashing ashore beneath the midday sun. Before you could say croquettes de poisson our starters, fish cakes and onion rings, had arrived. 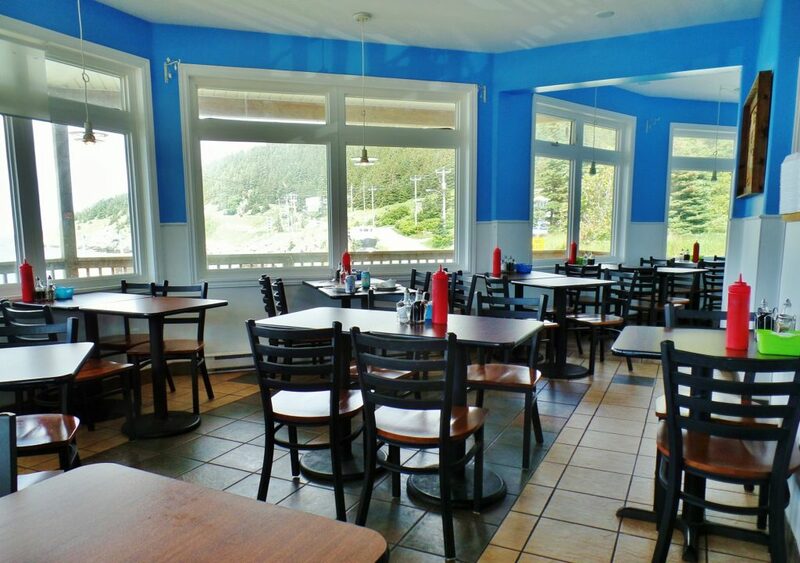 You don’t have to wait very long for your food at By the Beach. 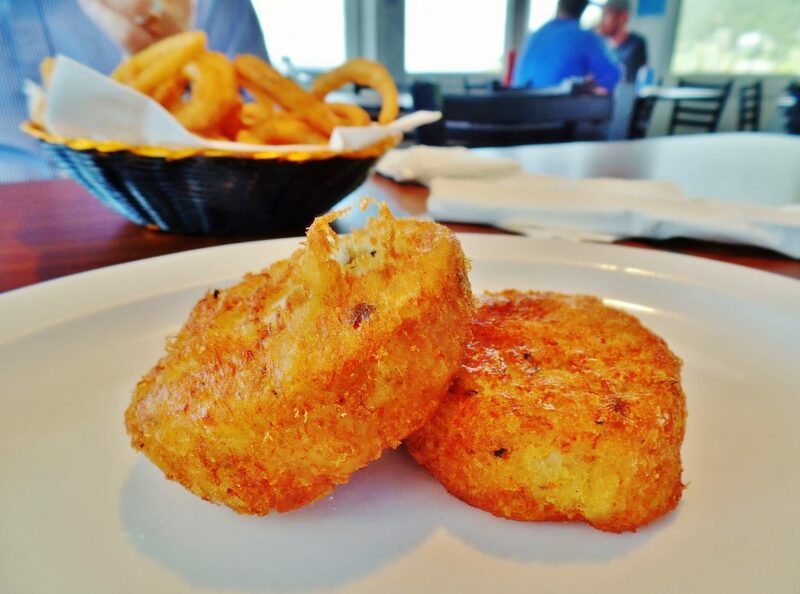 Our fish cakes appeared to have been deep fried. They were uniform and perfectly round, similar to a factory made product. The well-seasoned cakes tasted good but contained as much potato as fish. I think a restaurant, as opposed to a family stretching its budget, should use potato or breadcrumbs in fish cakes as binder not filler. I agree with John Bishop, chef and owner of famous Bishop’s Restaurant in Vancouver. In the cookbook, “Fabulous Fish Cakes” he says, “Use just enough breadcrumb or cracker filling to bind the cakes, as this allows the seafood to shine through.” He’s right, of course. In a cod cake it is the cod that should “shine through”. 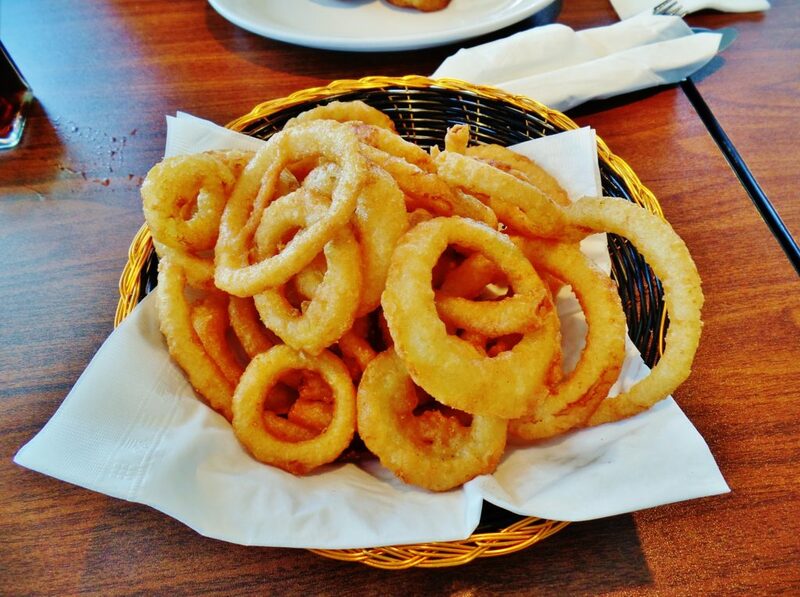 By the Beach’s onion rings were small and quite crisp. 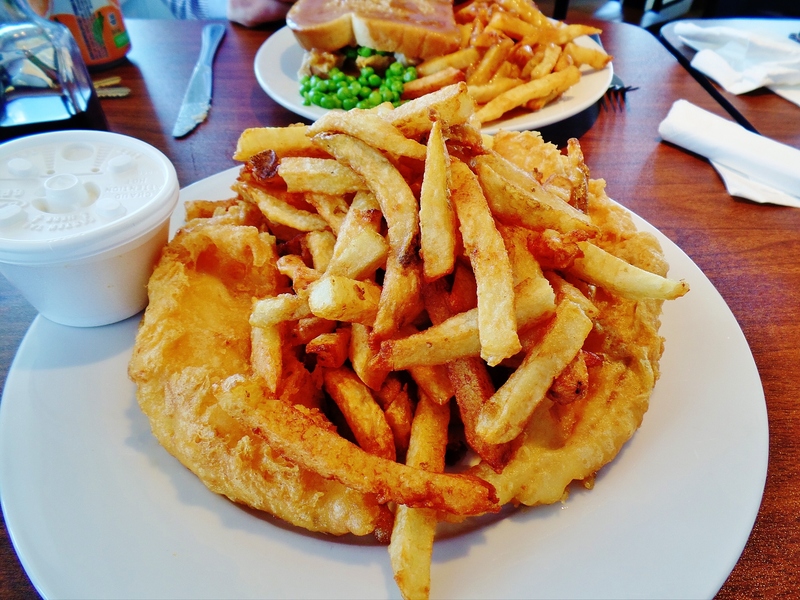 (They have perfected their frying times for battered ingredients at By the Beach.) Usually, when I bite into an onion ring I get more than just a hint of onion flavour. These onion rings tasted more of fried batter than of onion. It may have been because of the variety of onion used, or the thickness of the sliced rings. 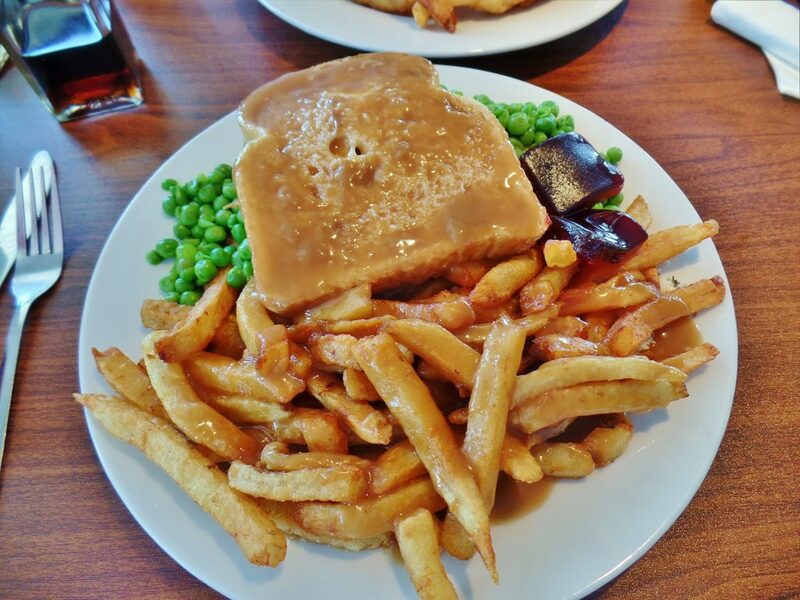 A close competitor of fish and chips as Newfoundland’s most popular take-out food is the hot turkey sandwich – slices of roasted turkey between two slices of store bought bread smothered in gravy. In this case it was white meat in the sandwich. Some places will ask if you prefer white or dark meat. Accompaniments were dressing (stuffing), green peas and chips. I enjoyed the taste of the sandwich, including the chips. They were plump and soft on the inside, unlike the chips that came with By the Beach’s fish and chips. They were a little shriveled and dry on the inside. Many of them were scraggly at the edges. On the other hand, the battered, deep fried cod was extraordinarily good, from top crust to bottom crust, as well as everything in between. There was no soggy layer with the batter, just a clean, crisp shell covering milky, delicate cod that flaked beautifully. They obviously know how chips should be cooked and served at By the Beach because the chips with the hot turkey sandwich were good. More attention needs to be paid to make sure only the best chips are served to paying customers. Let’s face it, By the Beach made its reputation on fish and chips. Meanwhile, I highly recommend By the Beach’s deep fried cod. Price A meal for two with appetizers, drinks, tax and tip costs approximately $60. Service Helpful and very friendly. Ambiance Greasy spoon with a great view. Open Daily from 11:30 a.m. to 7:30 p.m.
Credit cards Cash only but has an ATM machine. Parking By the Beach has a parking lot near the building. Beverages Soft drinks and local beers. Wheelchair access By the Beach is fully accessible, with a wheelchair ramp at the rear of the building and accessible tables and restrooms.